The C 328 ties together all the critical elements of a top performing music system; music sources past and present, while providing a deep reservoir of power that allows your speakers to reveal every nuance of musical detail. This advanced amplifier includes many cutting edge technological breakthroughs developed by NAD over a 45-year history of creating affordable ultra-high performance audio components. It is surprising how many seemingly advanced products in the market today often miss the most basic requirements for satisfying performance. Low noise circuits, precise volume control action, accurate channel balance, proper input and output impedance characteristics, high overload margins and stability with difficult speaker loads. NAD starts by getting these things precisely right and advances from there. 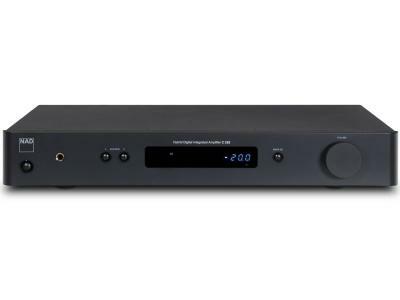 We include an MM Phono stage with precisely accurate RIAA equalization, high overload margins, extremely low noise, and an innovative circuit to suppress infrasonic noise that is present on all LPs – all without affecting bass response. Our line inputs can accommodate all kinds of analogue source components by offering ideal input impedance characteristics with linear ultra-low-noise buffer amplifiers to prevent any sonic degradation caused by inappropriate loading of the source device. We include a separate headphone amplifier with low output impedance and very high output voltage capability – enough to drive even high impedance studio monitor headphones. The low impedance line outputs can connect to a subwoofer to extend the versatility of this well thought out amplifier. These are all details you can hear. NAD has moved away from the old fashioned and power hungry linear power supplies and Class AB output stages that waste nearly half of the energy consumed producing heat rather than sound. Instead we have developed even better performing circuits based on switch mode power supplies and Class D output stages. Once thought to be inferior to traditional topologies, NAD’s advanced work in this area has created some of the best performing amplifiers regardless of the basic design principle. These new designs are very linear over a wide bandwidth and provide consistent performance into all speaker loads, providing a dramatic advance over previous models. 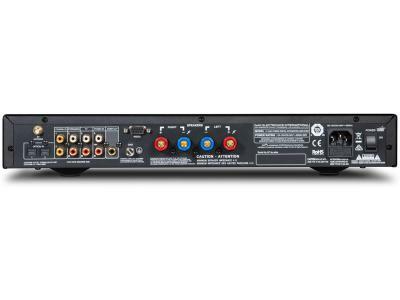 The power supply provides plenty of headroom able to provide, on demand, over 100 watts of audio output when needed. It can operate with any AC mains voltage from 100V to 240V and provides pure DC power to all the various stages of the C 328. This highly efficient supply also provides near perfect regulation of voltage across a wide range of conditions and provides a solid noise-free foundation for the amplifying stages. The C 328 uses a customized version of the proven Hypex UcD output stage. This allows for massive power with nearly unmeasurable distortion and noise in the audible range. Every detail of this design has been carefully crafted and perfectly executed to wring out every last drop of performance. Note: The RIAA response is consistent with a pre-emphasis that is rolled off at 50kHz by a second order filter, such as used in Neumann cutting lathes.